I know I said that Cambodia is more than Angkor Wat, but the temple is Cambodia’s main tourist attraction for a reason. It is stunningly beautiful. 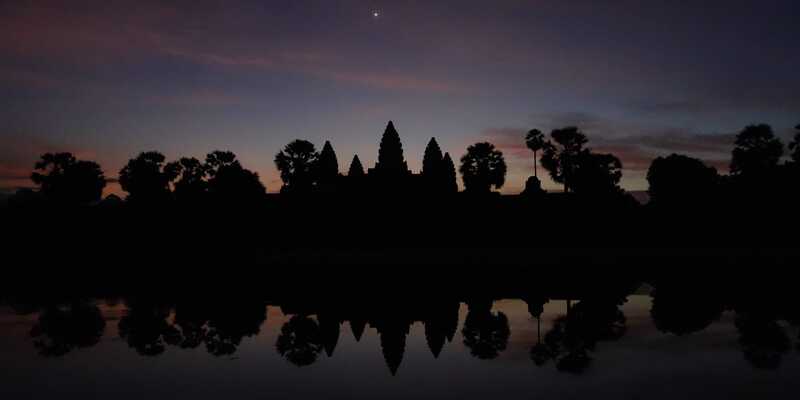 So beautiful that we went to watch the sunrise at Angkor Wat twice. The second time we got here as early as the park opened and, for a short moment, were the only visitors. Crowds soon gathered behind us as the sunrise got more and more beautiful. After sunrise, go on and explore the temple. It is a huge complex spreading out over several levels, with wall carvings and Buddhist statues on the top level. Throughout Cambodia, you can find many reminders of the country’s tragic past. 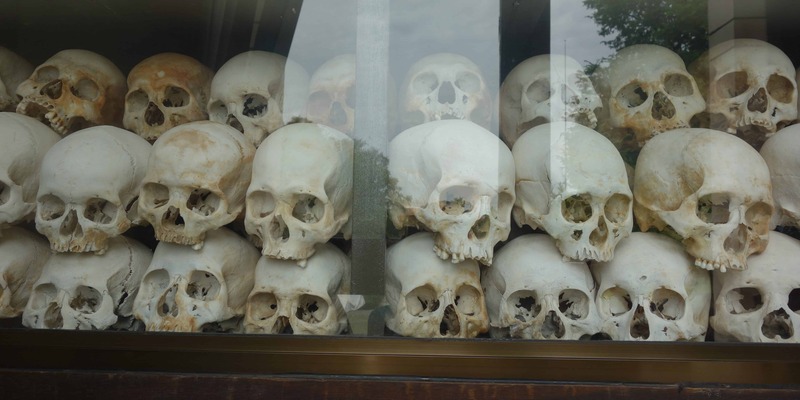 When the reign of the Khmer Rouge ended, Killing Fields were discovered all over the country. Some lesser known ones include the killing cave near Battambang, but the most well-known ones are the Killing Fields and the high-security prison S-21 in Phnom Penh. Many unfortunate souls were tortured in S-21. Once they admitted crimes they had never done, they were then transported to the Killing Fields. Entrance to those sites includes a great audio guide that will help you learn more about the Khmer Rouge and the genocide in Cambodia. One of my favourite parts about Cambodia were the floating villages. 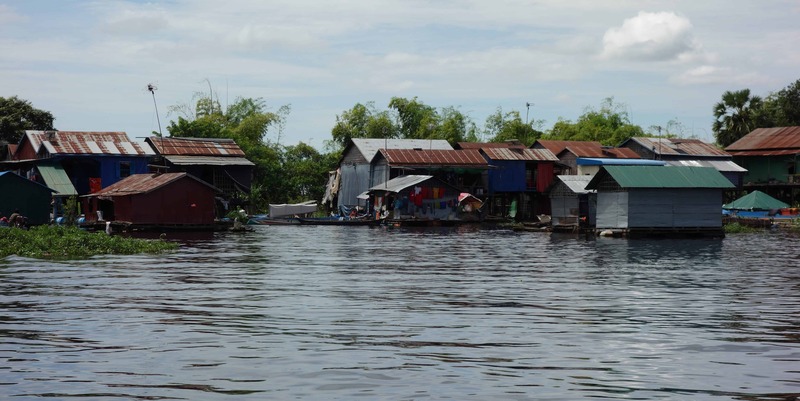 We went by boat from Battambang to Siem Reap and came across many communities living in floating houses on the water. We saw children getting from one house to another by boat, floating shops and floating schools. Their whole lives take place on water. If you’re not going from Battambang to Siem Reap, you can also see those villages by taking a boat trip on Tonle Sap Lake. It is an easy half-day trip from Siem Reap. Besides Angkor Wat, Ta Prohm is Cambodia’s most famous temple. It featured in the movie Tomb Raider and is known for the trees that have overgrown its walls. Walking through the ruins that have half tumbled down, it is easy to feel like an explorer stumbling upon a lost temple. 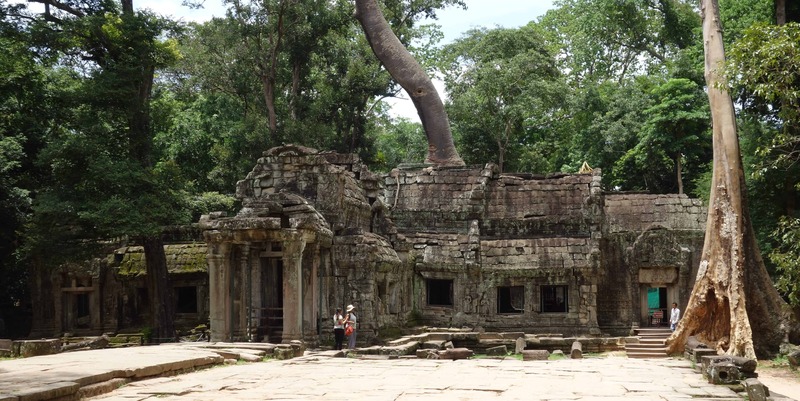 Ta Prohm isn’t the only jungle temple at Angkor. If you want to visit a less popular one with less crowds, I can highly recommend Ta Som and Preah Khan. If you are visiting Phnom Penh, make sure to sign up for a sunset cruise on the Mekong River. Boats set out in the afternoon, going along the river to one of the floating villages. They then return to Phnom Penh just in time for sunset. When we did the cruise, the weather wasn’t great. We were still lucky, the sky cleared up enough for us to see a stripe of orange and purple above Cambodia’s capital. 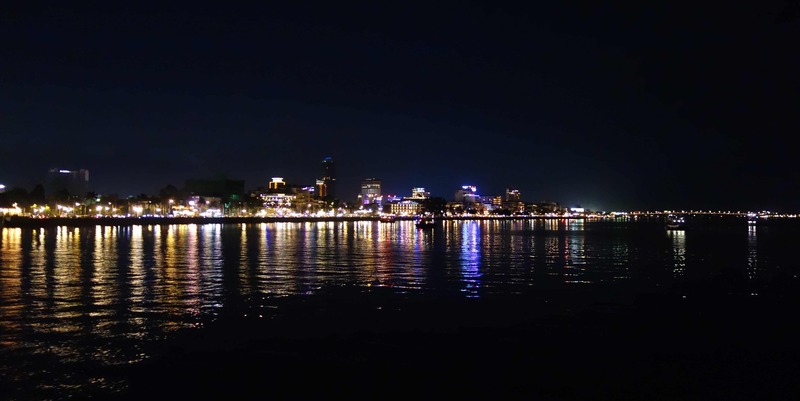 Plus, just the night view of the city made the trip worthwhile. The bamboo train was once used to transport rice from the fields into town. These days, it only serves as a tourist attraction. 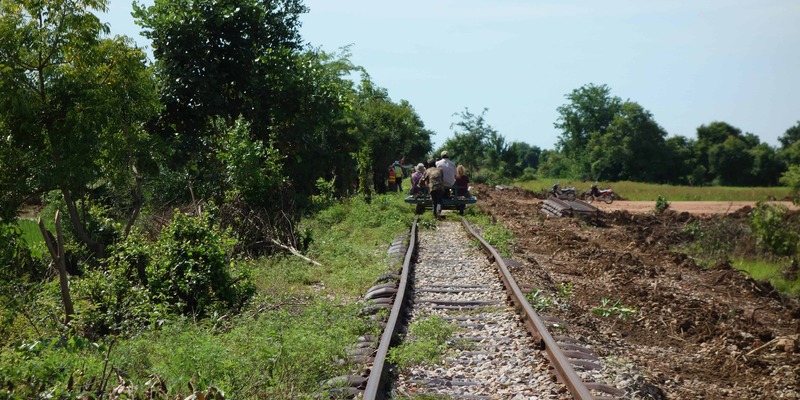 Don’t come to Battambang expecting the kind of train that you know from home. The vehicle here consists of wheels, a platform and a motor and can be disassembled within seconds. The ride takes you through rice paddies so green they look almost surreal. Once you reach the end, you will get off, wait for five minutes and then ride back. Since there is only one track, chances are that you will run into people going the other way and will discover just how quickly the locals move the train off the tracks and put it back together again. 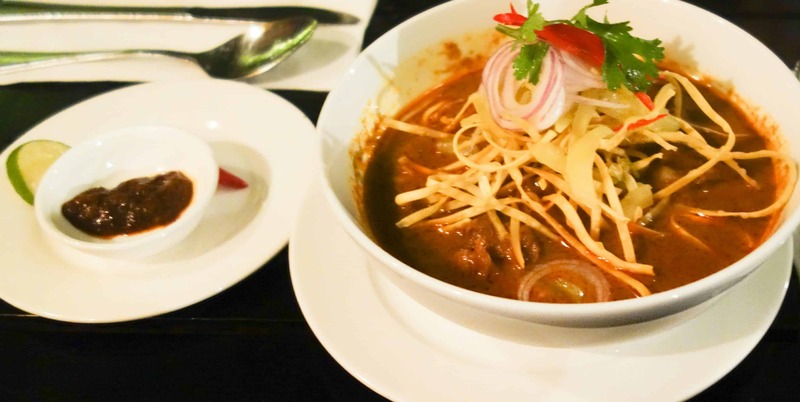 Cambodia is home to many charity shops and restaurants. Many of those will donate any profit they make to charity organisations. Some also train underprivileged youth, giving them a chance to learn a job and build a career for themselves. We went to the Friends restaurant in Phnom Penh. While it wasn’t the cheapest place we ate at, the service was great and the food was amazing. Besides restaurants, you can also find many shops supporting minorities and other people in need. Everybody goes to Angkor. 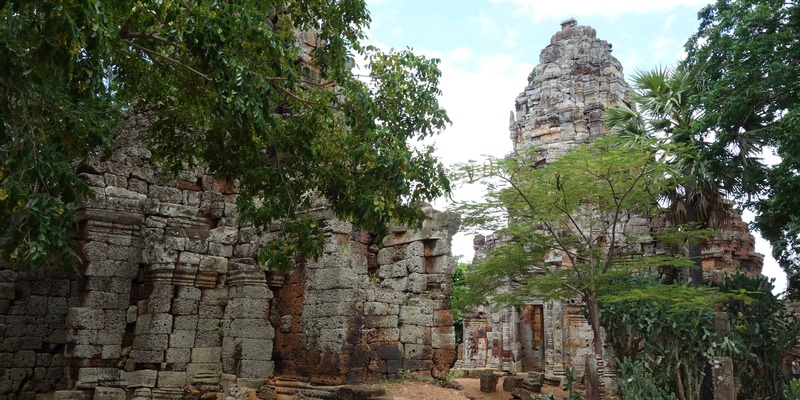 But besides the area near Siem Reap, you can find many more temples in Cambodia. The advantage of these sights is that you will often be the only tourist there. We went to Wat Banan, a temple located close to Battambang. It was built on top of a hill and as I walked through the ruins, with nobody else except my friends around, I almost felt like I was in a movie set. Some of the buildings have fallen down, others are barely standing and on top of that, I had a great view from the hill. During their reign, the Khmer Rouge killed the majority of artists in the country. Since dance and music were only transmitted orally, many traditions were lost. After the Khmer Rouge were defeated, a man set out to find as many artists as he could and teach their knowledge to the younger generation. You can see the result at the Cambodian Living Arts Cultural Performance in Phnom Penh, where you can watch many different traditional dances. 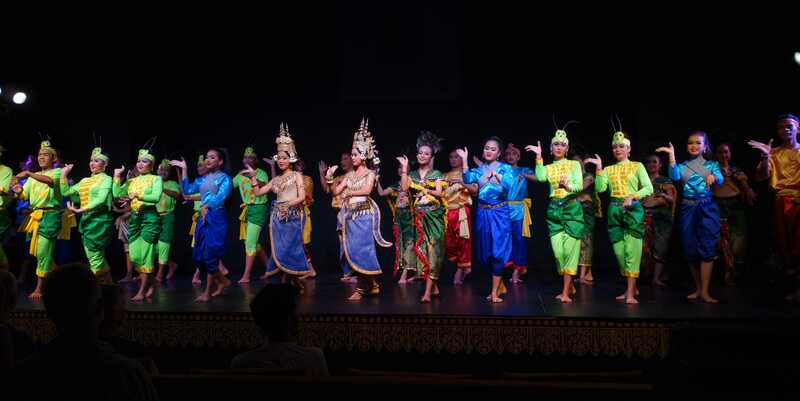 All profit goes towards training young artists and giving them a future, so the Cambodian culture will not be lost. Banteay Srei is a beautiful temple located north of Angkor. Our guide called it the pink lady temple, not because it was a place of worship for women but because it is built of red sandstones and shows many intricate and amazingly well preserved carvings. 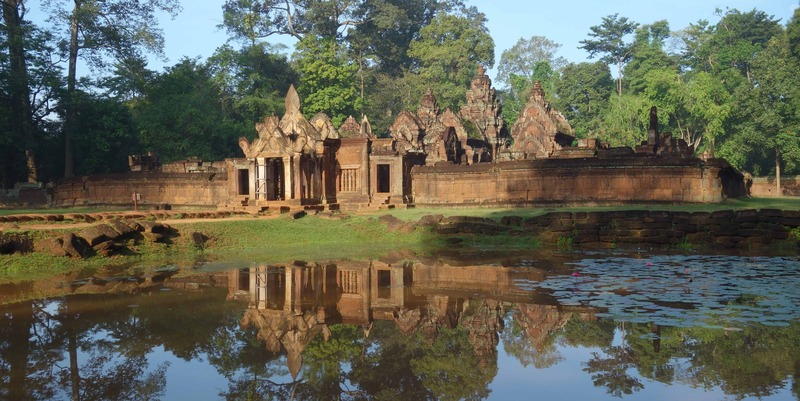 You can visit Banteay Srei from Angkor. A tuk-tuk ride will take about 45 minutes and is totally worth it. If you come early in the morning (the temple opens at seven), you might be lucky and have the building to yourself.